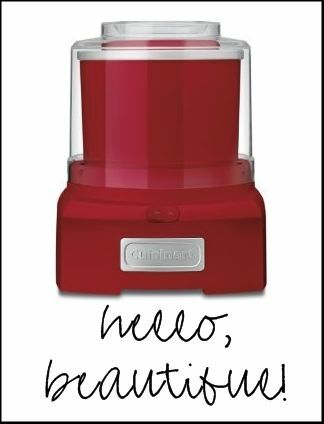 ....or a beautiful, red Cuisinart ice cream maker? If you would like the ice cream maker, tell me so and your favorite ice cream flavor. If you would like the Biscoff Spread, tell me so and what you would do with it. One winner will be chosen for each on Tuesday, August 23rd and 8pm CST. giveaway closed; winners have been notified and are listed above. We have an ice cream maker but have a best friend that could definitely use one! I look plain old vanilla ice cream- but sometimes, we put flavored coffee creamer in it to jazz it up! I would love to win the ice cream maker. My boys and I would have so much fun with it. My favorite ice cream flavor is cookies and cream. I would love the both! For the ice-cream maker, my favourite flavour has to be pretty chocolatey. Maybe moose tracks, white russian, or mackinac island fudge. Or just a plain old rich chocolate! Oh how I want an ice cream maker! My absolute favorite flavor is Lavender Honey, and it comes from Molly Moon's, a small ice cream shop too far away for me to have often! Probably for the best for my waistline, but I want to make it at home to have every day!!! I love ice cream and am in love with cake batter ice cream right now! I would love the ice cream maker! My favorite type of ice cream is maple nut! I don't have an ice cream maker, but have wanted one for awhile! My favorite ice cream flavor is anything that has chocolate and pretzels in it. I would LOVE the ice cream maker! My favorite is strawberry! I would also love the Biscoff Spread! I have never had it before. The brownies look wonderful, so I think I would try to make them! I would love the ice cream maker. I'd make chocolate hazelnut gelato with it, yum! I definitely need the ice cream maker. I was just talking the other day about how I wished I could make homemade ice cream, but how I could never manage to have one of those old crank ones in the house!! My favorite ice cream technically isn't ice cream, though--mango sorbet! So delicious. I would make homemade cookies and cream! I would most definitely eat that spread with a spoon! I've never had Biscoff before so I would love to try it! The brownies look delish! I'd absolutely LOVE the ice cream maker!! I'd make nutella ice cream first and then also speculoos ice cream (that's the name for biscoff here in europe!) Love your blog, thanks for the giveaway chance! I would love the ice cream maker! My favorite ice cream is chocolate chip cookie dough. Yeah, I kind of also want the spread. I would like to try it spread on some rye toast topped with sliced banana. I love butter pecan - salty/sweet, creamy/crunchy - hits all of the contrast buttons! I could make it in my ice cream maker....! Oooo I need me the ice cream maker for some amazing Bailey's and Carmel Ice cream!! I would love to try out your dark chocolate peanut butter ice cream in the ice cream maker. I have never had homemade ice cream! I would love the ice cream maker! My favorite ice cream is mint chocolate chip and I need an ice cream maker because it gets too hot in SC. I am a midwest girl living too far south. My husband's military service has moved me far away from home (Texas) and the Blue Bell ice cream that I love so dearly. So in order for me to be able to eat my own "Candy Jar", "Caramel Turtle Fudge", or "Homemade Peaches and Vanilla," I NEED AN ICE CREAM MAKER! I really do NEED the ice cream maker! And my favorite ice cream is chocolate peanut butter. I usually get the Haagen Dazs brand, but I'm itching to make your recipe. Thanks, Bridget. I require biscoff spread ....just because!! If it's anywhere near as addictive as Nutella - I'm a goner!! I've been longing for an ice cream maker, thanks for the chance! My favorite flavor is ... well I don't know... I love so many of them! I would love to try the Biscoff spread for the bar recipe you published, or just to eat it with a spoon (simple as that!). Thanks for the giveaways! I would love the Ice Cream maker! My favorite is coffee flavor! I would love love love the ice cream maker! My favourite ice cream is butterscotch ripple. So simple, but so yummy! And thanks for the double chance, I love the little biscuit cookies on the plane and would love to try the spread! I love strawberry cheesecake ice cream! And I can't wait to make some when I win that ice cream maker!!!! I just made pistachio ice cream last night and it was delicious! As for a favorite...strawberry? Or maybe peanut butter panic? I'm not sure. Clearly, I already have an ice cream maker, but I would love to win that pretty red one for my mom, who loves ice cream but her ice cream maker broke a few years ago and hasn't been replaced. Sad. She'd be thrilled with this one! Thanks! My favorite ice cream is Ben and Jerry's Phish Food! I need that ice cream maker! With the biscoff spread I would probably make cupcakes! Oh, an ice cream maker? I'd love one!! My favorite flavor is homemade Hawaiian. Bananas, pineapple, coconut, pecans, and marachino cherries. Fabulous! I love raspberry, blackberry, or boysenberry ice cream. Yummy! A new ice cream maker would do just the trick! Thanks for the chance to win! Oh I totally need the ice cream maker to make some strawberry shortcake ice cream. Or Chocolate fudge. I would love, okay LOVE, the ice cream maker. My standard favorite is rocky road, but that 3 ingredient chocolate sorbet looks like it needs to be made by me! I was just thinking today that I want an ice cream maker! Oh, all the wonderful things that I could maker. As far as a favorite ice cream...that is too hard of a question to answer, but I pretty much like anything with chocolate in it. And i've been looking everywhere for the spread! I'm dying to try it! It sounds amazing. Pretty Please with Biscoff and Ice Cream on top!!! I need an ice cream maker because mine is a silly old crank one! It makes me so unmotivated to ice cream. Hmm, my favorite ice cream is Cookie Dough, Brownie Fudge, Dark Chocolate, Vanilla, Strawberry, Cookies and Creme, Almond, Baileys...and the list goes on and on but I would love to try and make Chocolate Chip ice cream, the kind I had when I was a little girl with actual chocolate chips instead of chunks. LOVE peanut butter ice cream! I would LOVE the ice cream maker! Mmmm rocky road is my favorite flavor! But I really also need the Biscoff cream because I have at least 3 recipes I need to try (including yours) and I can't buy it anywhere around here! My favorite ice cream is fresh peach.....homemade of course! I'd love the Biscoff spread. I'd make the brownies, and probably just eat it on toast or anything else I could find! I would LOVE the ice cream maker! My favorite flavor is chocolate chip cookie dough....but there are several recipes from David Lebovitz's book that I'm dying to try! My fave ice cream has to be cookies and cream. Those brownies look wonderful!! I would have to make them if I won the Biscoff spread. I've never used biscoff spread, soooo, I don't know what I'd do with it. But it looks dang delicious, so I'd sure I'd figure out something fun! I would LOVE the biscoff spread. I would bake up a batch of your biscoff brownies. When I saw your brownie post the other day it got me thinking about brownies and I whipped some up last night (but sadly, without the biscoff!). I would love the ice cream maker! I love vanilla ice cream, but would like to jazz it up with chocolate chips (or cookie dough!). I need both, my ice-cream maker is acting up, I can't make my favorite peppermint candy ice cream. So yummy and fresh! Ooh - the ice cream maker!! I added one to my Christmas list after seeing your recipes! 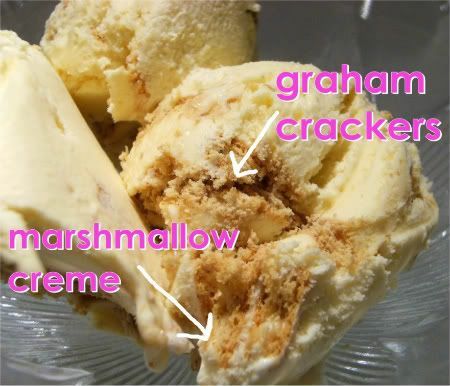 My fave flavor is Graham Central Station from our local Brusters, so the graham cracker / marshmallow cream recipe would be perfect (minus the lime!) Yummy! It would be a blessing to win the ice cream maker. My favorite is Cookies-n-Cream!!!! I would have to go with the Biscoff spread. After the Biscoff brownies recipe you shared earlier this week, I found Biscoff cookies and ate every last one in no time flat. They are delish! My fave ice cream is coffee variations. But if I had my own ice cream maker it'd probably be churing out a ton of dark chocolate too. My favorite ice cream flavor is mango. I need both! :-) I need those brownies to go with my peppermint candy ice cream I'd make in the new maker!! Yummy!! I would LOVE an ice cream maker! Favourite flavour? Mint Chocolate Fudge! ...but I am also highly intrigued by those Biscoff brownies! Ha! I so want both. But first, the ice cream. My favorite is coffee ice cream. MMMMM. I would love an ice cream maker! My favorite ice cream flavor is Reese's Peanut butter cup! I would love to win the ice cream maker to make mint chocolate chip! I would love the ice cream maker...my son has been hounding me to get one. My favorite flavor is old fashioned Butter Crunch. Thanks! I need an ice cream maker in the worst way! I would use it every single day, I'm sure. My favorite flavor is vanilla with loads of nuts, chocolate, fruit or cookies mixed in! Its a tie for my favorite ice cream flavor. Either Chocolate Coyote ( chocolate ice cream with cinnamon and cayenne pepper) or Oatmeal Cookie Chocolate Chunk. I would also love to try to make some pumpkin ice cream this fall...Basically i really need this ice cream maker haha! I love chocolate chip ice cream- but it has to have a delicious vanilla base and dark chocolate chunks! 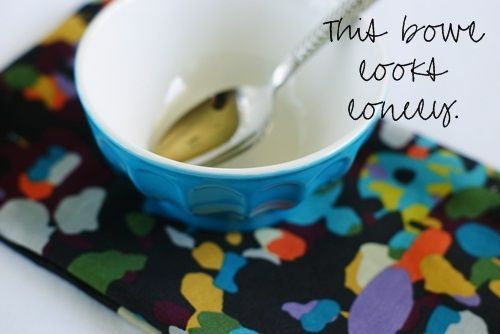 I would love both-I have worn out my white mountain freezer and this tabletop size would be so much easier! I have shopped around here for the Biscoff spread and can't find it-so I could use BOTH! I love Brown Bread ice cream-made with GrapeNut cereal and maple syrup and I'm thinking a "Biscoff" flavored ice cream would be delicious-therefore-the "need" for both! THANKS! What a challenge, to try to decide! I have been pining after that icecream maker for a while now! I think the first flavor I would make would be mint chocolate because that is my favorite, but then after I was through, I would make something peanut buttery for my DH! B&J Midnight Snack...sweet and salty! Or maybe Biscoff spread icecream... I love those cookies! I saw that biscoff in the supermarket and immediately thought of the brownies- but I still didnt' buy it because I was scared I wouldn't like it. I hope I win so I can give it a fair try! Oh wow I would love the ice cream maker! My favorite ice cream is rainbow sherbert for sure. 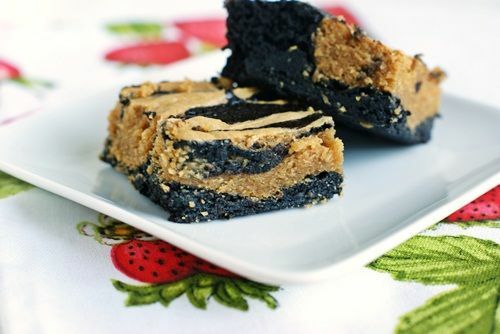 If I won the Biscoff spread, I would make those yummy stripey brownies pictured above! Admittedly, I've never had it, but I've had Biscoff biscuits and they were heaven. Share the love with a newbie!!!! I need the ice cream maker, because ice cream is my husband's absolute favorite food and the fancy flavors he likes are just too expensive in the stores! My favorite kind of ice cream is peanut butter! i would love, love, love the ice cream maker! i'm obsessed with ALL kinds of ice cream. my lactose intolerance hates it, but my taste buds LOVE it. i think chocolate and reese's tie for first place in my heart. yum. I've wanted an ice cream maker for so long now! I would make all kinds of flavors...I love anything with chocolate and peanut butter the best. OOOOOO, I'd love the ice cream maker ..... my favorite flavor is the old Baskin-Robbins Here Comes the Fudge and I hope to replicate the recipe soon. i do need an ice cream maker. you are right! it's a must! my favorite ice cream flavor is ben & jerry's creme brulee! have you had?? it's amazing! - unlike any other! Chocolate ice cream is my favorite! And I'd use the Biscoff Spread to make your Biscoff Brownies of course . . . probably to serve with that chocolate ice cream. And secondly, I want the Biscoff spread because I just saw your brownie recipe and decided I needed to find some!!! So, I would make those brownies. I need the ice cream maker. This heat is killing me. I'm about to lose my bananas. My favorite ice cream flavor is chocolate. Or is it vanilla? Hm, I also like coffee, banana, peanut butter, chocolate pudding ice cream. And the list goes on! And my favorite color is RED! And as far as that ice cream maker. CUTE. I want to learn to duplicate Baskin Robins Firehouse 31. Anyone had it? It tastes like a red hot candy! New addiction that I must duplicate! I am going to put that Biscoff spread between two Biscoff cookies and it will be the best thing that ever happened to my mouth. I would love a chance to win the biscoff spread. There seems to be this HUGE spasm of biscoff love, lately on many of the blogs I follow and the sad part is, I've never even tired it - no spread :( - not even the cookie :( :( . The first thing I would do with it, (this is a little embarrassing) is eat it with a spoon :$ - - lol then I would bake those divine brownies you posted. I need the ice cream maker! I love rocky road ice cream, but I don't always want nuts. I would love to be able to make my own flavors. Thank you for the giveaway! I would love to have the ice cream maker! My favorite flavor is Mocha Almond Fudge! Ice cream maker!!!! Or Biscoff!!!! I cant decide. Biscoff. Definitely Biscoff! My favorite store-bought ice cream is chocolate fudge brownie. My favorite homemade is plain old vanilla. That ice cream maker matches my kitchen. I need it for "decorative" purposes. yeah, that's it. My favorite ice cream is Blue Bell's Mexican Praline. I would hurt people for it. I also need the ice cream maker as I'm buying a home and need things to fill it with. My favorite ice cream flavor is Moose Tracks. The ice cream maker is so cool! Don't hate me ... I'm not a big fan of chocolate ice cream! I do, however, LOVE vanilla! Thanks for the chance to win! I would love an ice cream maker. I would make my favorite--vanilla ice cream. With that as a base--endless yummy possibilities! I would loooove that ice cream maker! The one I have now is ancient....I have been seriously looking at these new easy-to-use models! Would LOVE the ice cream maker because.....I just found out I am pregnant and I love me some ice cream!!!! SOOO need an ice cream maker! I can't have dairy, so I often go buy my family their favorite icecream combinations at the store, and I'm left to drool like a puppy dog in a store window. My favorite dairy free ice cream is pomegranite chip, but if I made it - I'd make smore's dairy free ice cream!!!!! I think I could win extra points with hubby if I made those biscoff brownies! :) Maybe I could even tack a few new things onto the honey-do list! ;) Thanks for the chance to win! Have an ice cream maker, so I would die for the Biscoff spread. To make biscoff swirl ice cream, of course! My favourite ice cream flavour is Stoney Creek's Banana Fudge! Stoney Creek Dairy is near Hamilton, Ontario, they have the best flavours and it's local for me, so always very fresh... delish! I LOVE ice cream! Vanilla is my favorite - but I like to mix things in with it. I have a hard time deciding between cookie dough and heath bar, but I'm pretty much happy with any candy bar in my vanilla ice cream. I have had an ice cream maker on my wishlist for months! My favorite flavor is mint chocolate chip. Thanks for the chance to win! I also want the Biscoff spread! I would first make your Biscoff brownie recipe... my mouth watered when I read that post last week... drool! Oh of course, I LOVE and NEED an ice cream maker. My own favorite is chocolate. I really NEED an ice cream maker to make healthier ice cream for my kids. They just love frozen treats! 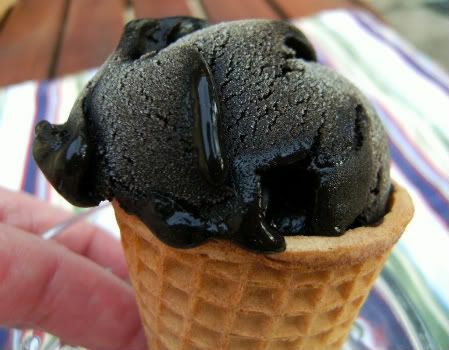 Gosh....the dark chocolate ice cream looks gorgeous! I definitely need the biscoff spread! I've already looked online and no where in my state sells it :( If I got it, I'd definitely make those brownies you posted. I can also picture using it in place of peanut butter in some cookies! 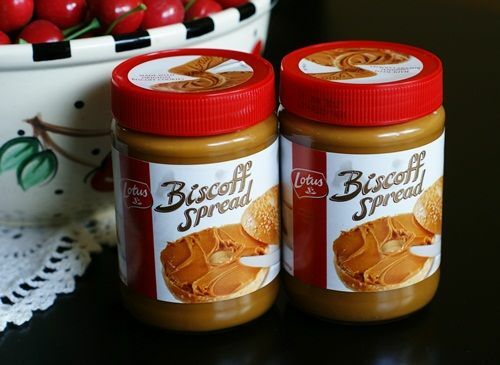 Biscoff Spread--I keep reading about it and have even started daydreaming about it. I would swirl it in my favorite vanilla ice cream. I would LOVE the ice cream maker! I love love love ice cream... choosing just one flavor feels wrong! My favorite would have to be mint cookies 'n cream. MMMMMmmmm. If I was lucky enough to get the ice cream maker, I think my first batch of ice cream would be the key lime pie ice cream! I would love to have the ice cream maker. I really like Mackinac Island Fudge, but my favorite ice cream flavor is vanilla! Yum! My favorite flavor is plain chocolate! I love it! I've NEVER heard of Biscoff!!! But anything PB is all me! Looks amazing. I hope I win! Thanks! Ok, and I'm leaving a comment for the Biscoff spread as well, because I have never had Biscoff, ever! I don't even think our stores carry it. Thanks again for the chance. I need the ice cream maker because I've been sweating all summer w/o air conditioning and I want some crystallized ginger ice cream! I would just eat the biscoff spread! I've never even tried it and I'm dying to!!! I would love to have the biscoff maker as well! I would definitely 'need' to make the brownies!! And of course, I could always use an ice cream machine!! Your dark chocolate peanut butter ice cream loos Incroyable! The first thing I would do with the Biscoff spread is eat it off a spoon! I've never had it before, but it looks yummy. My favorite ice cream flavor of all time is cookies 'n cream. I would Love the ice cream maker to make my favorite flavor Chocolate PB! Homemade strawberry ice cream is the best. My favorite ice cream changes from week to week but there is always chocolate in the name! Oh how I would love the ice cream maker. My daughter and I are ice cream fanatics and our favorite is a tie between cookie dough and graham cracker swirl. Such a great give away! we made mango frozen yogurt this summer, and from that experience I learned that we need a new ice cream maker! I would love to own an ice cream maker. Pistacio would be my first recipe! Thanks for the chance! Ice Cream Maker!! I would make pumpkin ice cream with gingerbread cookies and white chocolate chips in it!! Oh, man- YUM!!! My favorite ice cream is coffee! Oh my gosh, I was just on Amazon looking at this exact ice cream maker! I WANT I WANT!! My favorite flavors are s'mores, rocky road or anything with Nutella on top. :) Thanks for a great giveaway! I would def make the brownies!! I think we'd also manage if we had biscoff ice cream, spread it on pancakes, oh man I'm hungry!! Living in the Mojave Desert I definitely would appreciate an ice cream maker!!! As a kid my dad made ice cream all the time and my favourite is his recipe for vanilla bean chocolate flake, followed closely by his banana fudge swirl! Thanks for the chance to win! Well, I wouldn't mind winning the ice cream maker, either. 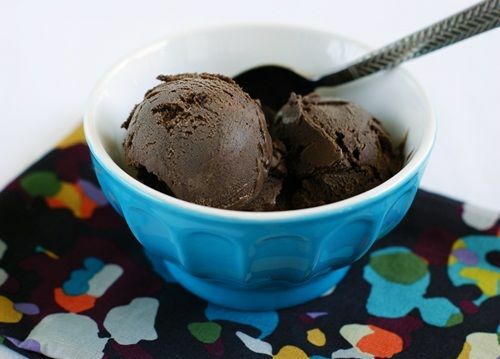 I really like double dark fudge ice cream...your recipe looks great! I have that ice cream maker and ADORE it!!!! So....I would love to try the spread. What would I do with it? Make those brownies of course! The ice cream maker would be great! Favorite ice cream is double chocolate malted crunch. First, I would love the ice cream maker - it rocks! and I would want it in the red color! Gorgeous! Totally need the Biscoff spread, because those brownies look AH-mazing! Second, I would love the Biscotti spread, as I have had it before and it is to die for! I love it on a graham cracker with marshmallow cream! Would love an ice cream maker -- we have an old-school one that uses ice and rock salt, but this one looks lovely (and it's RED!) My favorite homemade flavor is Earl Grey Tea ice cream -- just infuse tea bags in the liquid before freezing! Yummy way to make truffles too. I would love the ice cream maker to make my favorite-cookies and cream ice cream. Yummy! I've never had an ice cream maker before, but it sounds like an excellent tool. My favorite flavor is a combination of peppermint, chocolate, and white chocolate, and I bet I could find the perfect combination with a few trials and errors involving the ice cream maker. I'd like the spread~I have an ice cream maker that I love so much, and that spread intrigues me! My favorite ice cream flavor is Salted Caramel. Divine! I've never try Biscoff spread before... But anything about PB I love it ;-).... I like to make cookies with Biscoff spread ... Yummy!!! I need Biscoff spread so I can shovel it straight into my mouth upon opening it. Amazing giveaway! 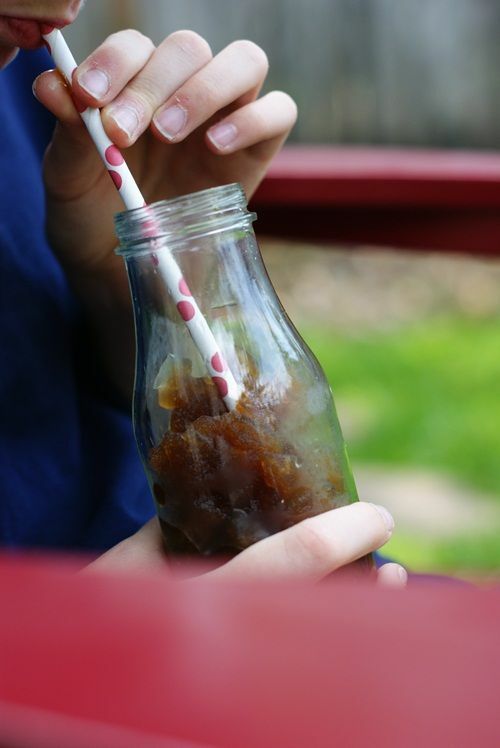 It would be so fun to be able to experiment with coming up with your own ice cream flavors! I'm just dreaming of all the possibilities. Fav icecream flavor is definitley butterpecan though! I can only imagine how that would taste homemade.. I NEED me some of that Biscoff spread so that I can make me some Biscoff brownies. I used to live in Scotland and would always treat myself to Biscoff biscuits when I was riding on the train! If I won the Biscoff Spread, I would make your brownie recipe. It looks amazing! I *need* an ice cream maker so I can make my two favorites: rocky road and mint chip! I would love, love the ice cream maker. I am just starting out to bake, decorate, and make all kinds of yummy desserts and the ice cream maker would be perfect! My first creation would be to make chocolate chip ice cream-my favorite! The ice cream maker! And I have two favorite flavors - Mackinaw Island Fudge (from Michigan) and Mint Bon Bon with chocolate syrup! But I would LOVE to be able to make my own SLUSHIES! That's been my #1 craving this pregnancy! Thank you for the opportunity! Well, like a lot of people I think I might need both. I would love an ice cream maker....hmmm, I would probably make some fruity ice creams for me and some coffee ice cream for my honey! chocolate peanut butter cup for me!! mmmm!